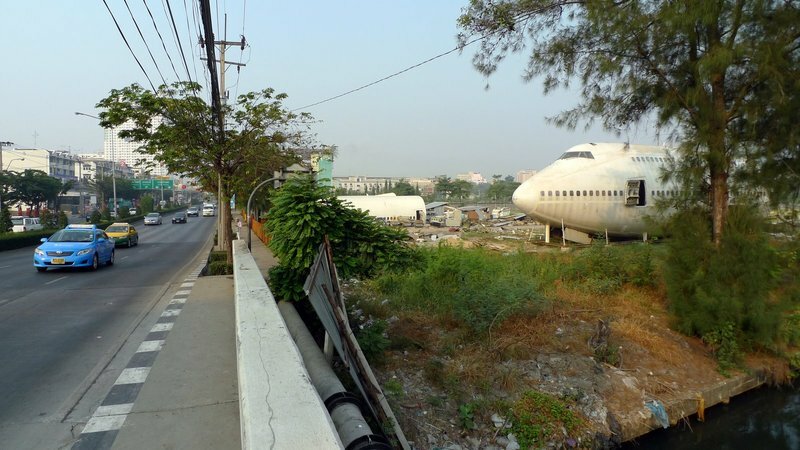 Two Saturdays ago, as Tawn and I were driving along Ramkhamhaeng Road on an errand to the northeastern outskirts of Bangkok, we were taken by surprise when we saw the front third of a Boeing 747 jumbo jet propped up alongside the street. This is neither an industrial area nor anywhere particularly close to the airport, so for there to be a pair of airplanes being disassembled in this neighborhood is downright strange. While there is a fence along the front of the property, there is no proper gate along the entrance. The entire site is probably four acres (16,000 sq meters), adjacent to a school, temple, and canal. Condo towers and office buildings are visible in the distance and it is really a strange place to be disassembling airplanes. The monk’s dormitory (robes hanging to dry) is visible next door. I guess this view reminds them of the fundamental Buddhist teaching about all things being impermanent. There are two planes here, both from Orient Thai Airways, a local carrier that operates limited scheduled service and also does charters. I like how the top of this plane looks like a whale surfacing from the waves. 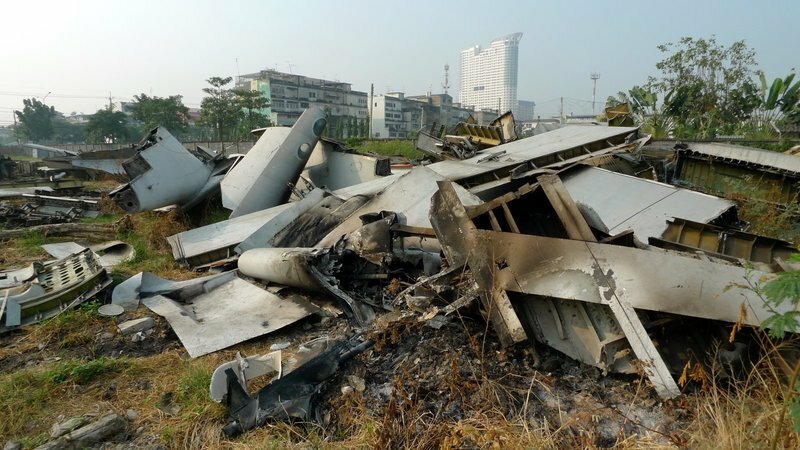 You could be mistaken for thinking this was the set of an airplane disaster movie. Every area that has been cut by a welding torch is scorched black and there also looks to have been a few small fires set. 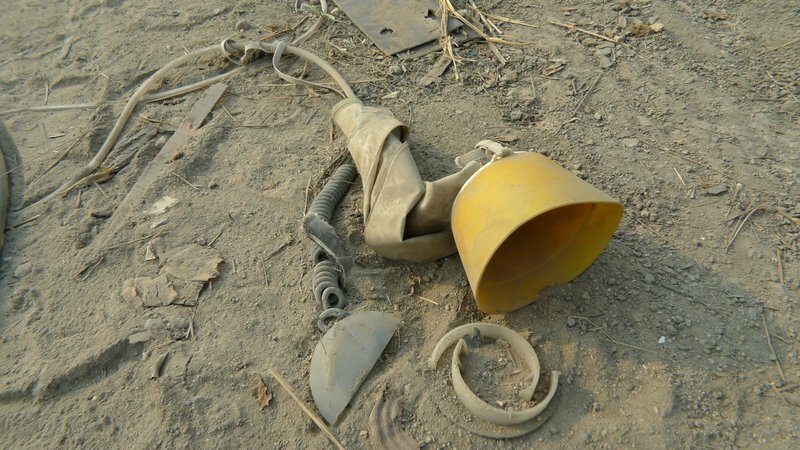 Pieces are still very identifiable, though, provided you know your airplane parts. The vertical stabilizer (tail) of the plane, being cut into smaller segments for disposal. The red and blue color scheme, which was meant to represent the Thai flag blowing in the wind, has been deconstructed. There were hundreds of oxygen masks on the property, most still stowed in the overhead compartments that had ben removed and stacked. Near the front of the property, galleys and lavatories, which are modular units, were standing about, stripped of carts and other supplies, although with the ovens still intact. Recalling his days working as a regional flight attendant for United, Tawn pretended to be setting the ovens to warm a meal. Orient Thai had a fleet of about a half-dozen older model 747s. Their only scheduled international service was to Hong Kong and Seoul, and they used their larger planes mainly for charters, especially during the Haj. Note the lavatory signage in Arabic as well as in Japanese. This plane’s original operator was Japan Air Lines. A two-door segment of one of the planes – basically, the front third of it – was intact and propped upright. The street cleaner explained that it was destined to be sent somewhere to become an airplane-themed coffee shop. “You can climb up!” she said. The homemade ladder had very narrow and widely-spaced rungs! Inside, the ceiling, carpet, and seats had been removed but wall panels were still intact. 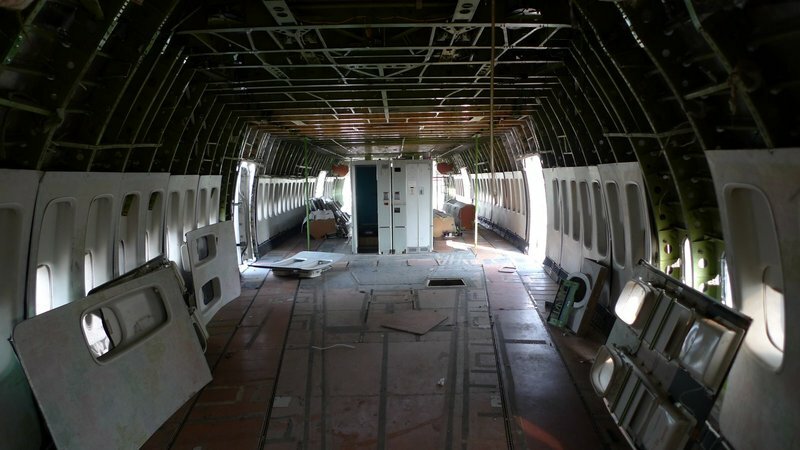 This picture is taken from the nose section, the front of what would have been first class, looking back. The opening in the floor is the access hatch to the avionics bay. Looking at the wallpaper, I noticed it is identical to that which was on the Orient Thai 747 that I flew as part of an inaugural test flight from the Don Meuang Airport to the new Suvarnabhumi Airport in July 2006, about two months before the new airport opened. I wonder if this was the same plane? I climbed the stairs to the upper deck. Used as business class for most airlines, both Japan Air Lines and Orient Thai had put additional economy seats up here. 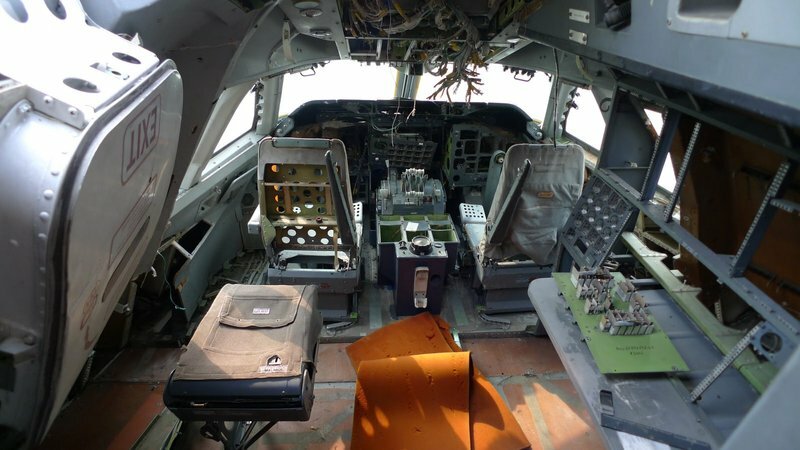 The avionics had been stripped from the cockpit but it was still relatively intact. The flight engineer’s station on the right-hand side is a clue to the airplane’s age: at least 21. The last 747 with a three-person cockpit crew was a 747-300 built in September 1990. Since then, they have been flown by just two people, with computers handling the functions that the flight engineer used to. After working up a sweat and shooting some 250 pictures and 30 video segments, I finally decided it was time to wrap up and head home. I felt a bit of nostalgia and melancholy, sorry to see planes that had been so technically sophisticated, and that had flown hundreds of thousands of people around the world, reach the point where their only value was for their scrap. Edit: Found this link listing the history of all of Orient Thai’s former 747s. 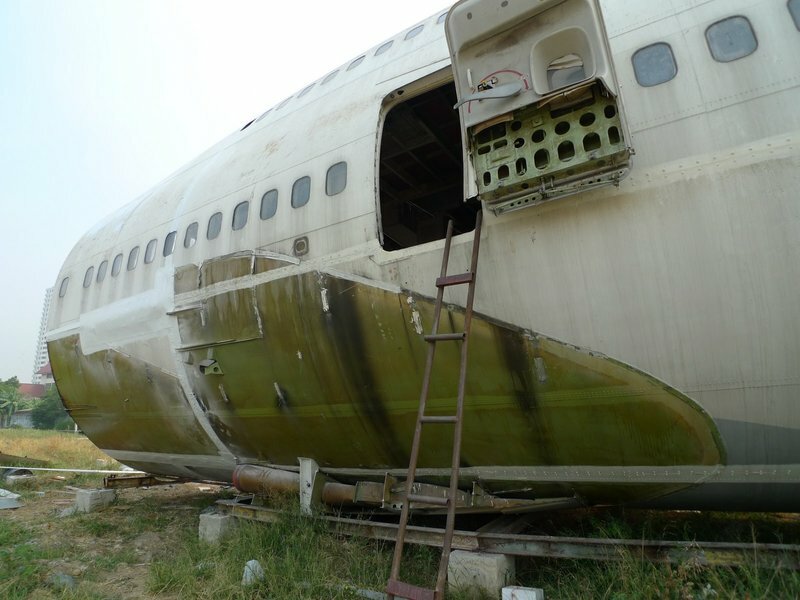 Looks like the plane that is completely scrapped was originally delivered in March 1979 to Japan Airlines and the one with the intact front third was delivered in December 1986, also to Japan Airlines. From that website I was also able to confirm that, as of this past December at least, the plane I flew on the test flight to Suvarnabhumi is still in operation. 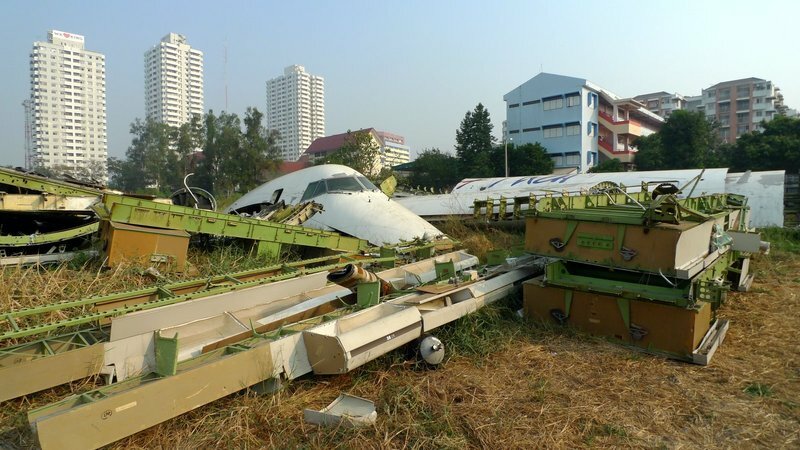 This entry was posted in Uncategorized and tagged 747, Airlanes, airplane, airways, Bangkok, Boeing, Disassembly, Graveyard, Orient, thai, Thailand by christao408. Bookmark the permalink. Cool, but also weirdly post-apocalyptic. Cool post! Haven’t seen the video yet, will stop by again and check it out. The script for the video was very well written. I can see you’ve put a lot of thought into it. (now if you told me that it only took a few minutes to write it I would be blown away). It’s sad to see something that was once so majestic being stripped to the bare skeleton. I was wondering though how they transported the planes there? But why is the 747 cut up far away from the airport and how did it get there? I’m surprise there aren’t more people hanging around that place. Were there anyone else there that you saw? How the great fall out of use and are discarded almost as some do with the elderly of their families! It is a great post! This could make a great Disney movie plot! Aero the cheeky 747 is created, flies people all over the world, gets old, faces his fate like his older friends for the scrap heap but is rescued and ends up as a flight themed cafe! We should write it and make our fortune!!! @beowulf222 – @stebow – The big question everyone has which I didn’t answer: how did they get the planes there? 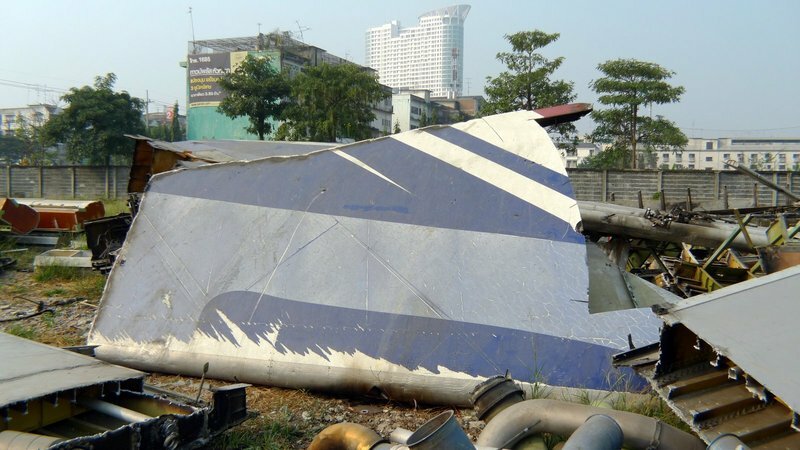 I would imagine that the planes were initially cut into large sections – wings and tail removed and fuselage cut into four segments – and then carried by a large flat-bed to this location. 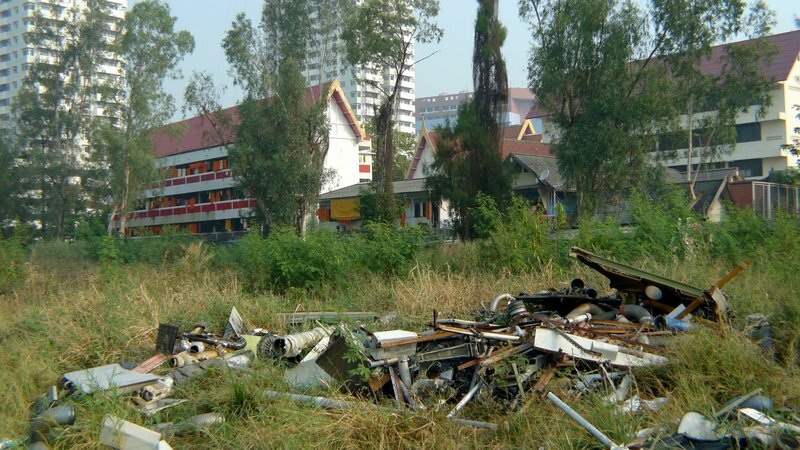 Most likely, the cutting was done either at the old Don Meuang airport or maybe at the U-Tapao military base near Pattaya. @murisopsis – It is a matter of economics. 21 years old isn’t particularly old for an airplane, but the types (747-200 and -300) were older and were very inefficient. With fuel getting more expensive over time, Orient Thai purchased used 747-400s, the first of which arrived in September 2010. Two more are coming from United Airlines, planes which were built in 1992, so among the oldest -400s around, but still more efficient than their even older -200s and -300s. @ElusiveWords – Glad you liked it, Matt. The script took a lot of thought throughout the week but when I finally sat down to write it Sunday afternoon, the words came together quickly. A week of organizing my thoughts will do that, I guess! @Fatcat723 – Good point, although we don’t chop our seniors up for parts, thankfully! @Roadlesstaken – No we were the only ones there. Of course it was 7:30 on a Sunday morning. I got the impression that if the workers were up and actively engaged in their work, we probably wouldn’t have been so welcome to wander around. 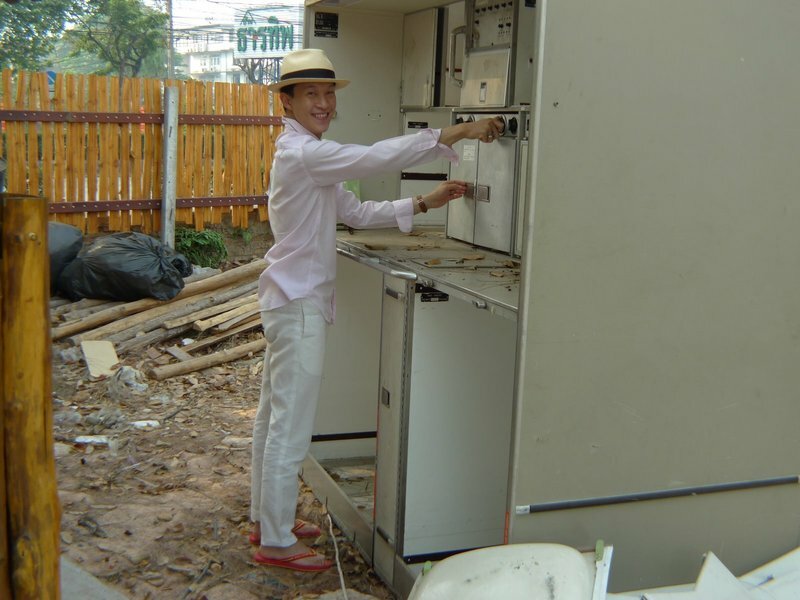 @stevew918 – A Bangkok Xanga meet-up spot! That’s a cool idea, Steve. @Finity – That’s a good word for it. Hadn’t crossed my mind at the time of writing but now that you type it out, it seems the perfect fit! @Dezinerdreams – Come back and let me know what you think of the video, please. @christao408 – Interesting. My knee jerk thought is that cutting up the plane somewhere else first and then moving it to this location cannot be economical but probably it is. Space around the airport might be more expensive. Still funny and odd at the same time. 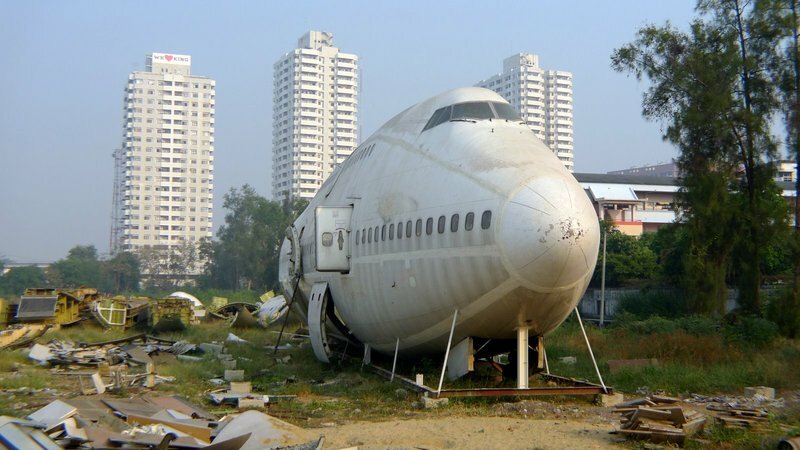 oh 747s…RIP…..but it’s really interesting to have found this graveyard in the middle of ….nowhere? How strange to just dump an old plane there! Very interesting. Sad in a way. I couldn’t view the video. I got a message from the IE saying that it cannot display the page. Pfftt! Btw, Chris, the writing is not Arabic. It is Urdu. Just thought I would tell you. Both scripts look similar, and start from the right going to the left. Bravo! Great video and commentary. @tehls – It sounds kind of like Toy Story 3, doesn’t it? Why don’t you write an outline and we can discuss the script in March? @DCRobbie – Thank you very much. I’m glad you liked it. @ZSA_MD – Well, shoot… so much for really carefully researching my blog entries, huh? I wonder why it would be in Urdu instead of Arabic, as I know the airline used these planes for a lot of Haj charters, especially from Southern Thailand. 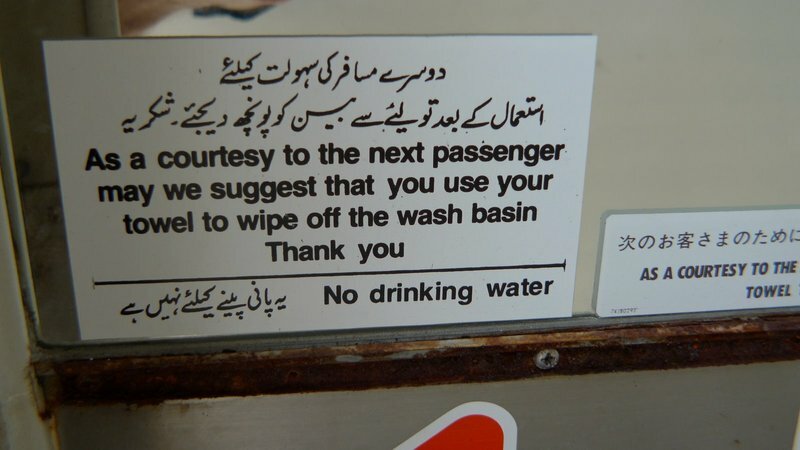 Perhaps Urdu is common there in place of Arabic? That seems unlikely…@icepearlz – Yeah, talk about your lack of zoning! @agmhkg – Of all the places it could be, this seems the most unlikely of them. 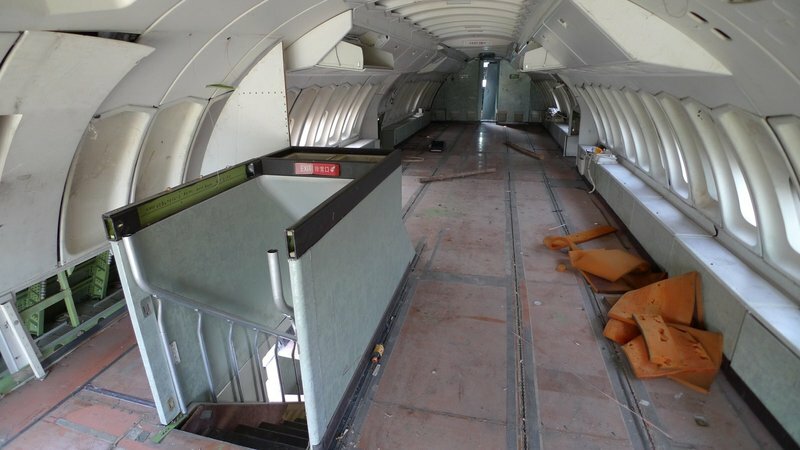 something really eerie about abandoned planes. I know there is a ‘graveyard’ of sorts somewhere out in the US. I’ve seen pictures of one that is absolutely huge, in the middle of some desert, not just Boeings, but old Cessnas and planes from the 30’s and 40’s. I can’t remember what the site is called but it looks very apocalyptic. I’d love to go if it’s open to the public. Thanks for sharing your pictures! @christao408 – People who travel for Hajj, from India and Pakistan make up about 60% of the Hajis. Perhaps these planes stopped and picked up the hajis from Karachi or Madras or Bombay. Urdu is more or less a common Muslim language in the South East Asian countries. I think that may be the reason. oh now that was fun! 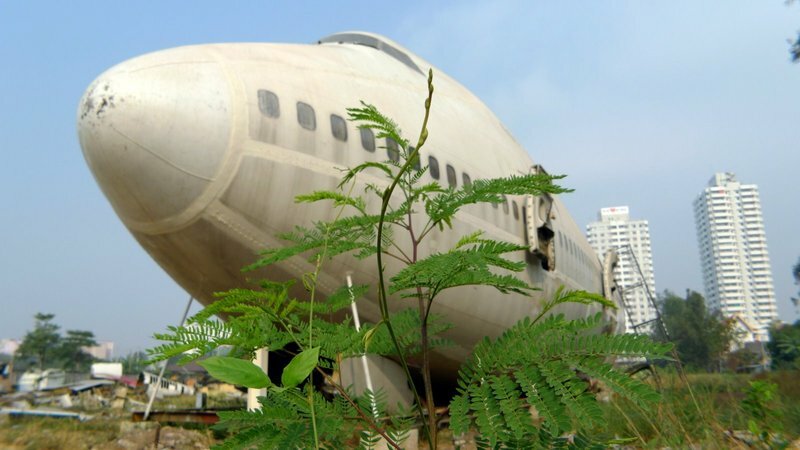 What an odd place, right in the midst of a residential neghborhood, to find an airplane graveyard! I’d be very curious to know where the heck will that ‘airplane themed’ restaurant is. You did a pretty good follow through reserach on those two planes! I guess we can always find a few interesting tidbits here and there in Thailand, especially Bangkok! This is so cool! I’ve always been drawn to things that are man made that are slowly disintegrating in some way, either by nature or by other man made means. It’s so interesting to me (and quite humbling in a way) to see these great things that we make being taken apart. It’s pretty typical for me to see cars at a junkyard an see them so stripped down. But it isn’t so much of an interesting sight compared to 747s. There is so much more to see. The words you used in your video can’t be used on a car on because the structure of a car is so much more simple. There isn’t much exploring. I can only imagine that this sight was an adventure! Very cool post! I went out there to check it out for myself, and it seems the configuration has changed a bit since your visit! More planes have been added and some of the mess has been cleaned up. It looks like they even reassembled one of those fuselages. Really cool, and I love how it evolves like that too! 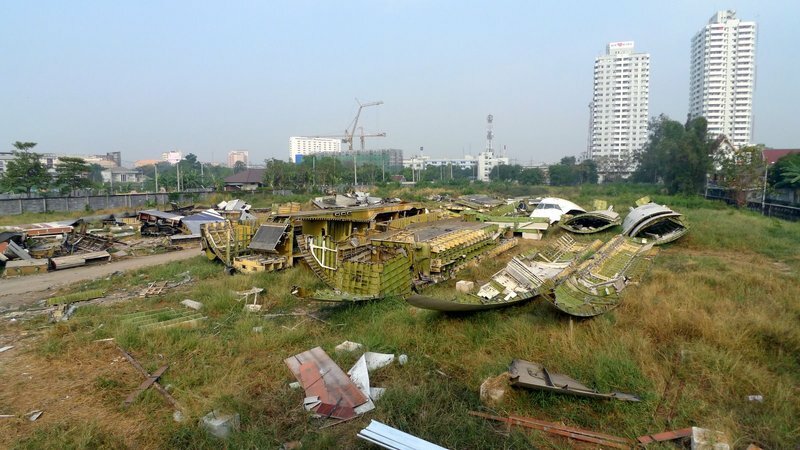 If you want to see what I saw, I posted some photos online here; http://wheresidewalksend.com/bangkok-airplane-graveyard/ 🙂 Thanks again for sharing and inspiring! Very cool Ian. Thanks for sharing the update. Thanks for the update. I’ve not been out that way in quite some time but last time I was, I noticed some MD-88s or similar.